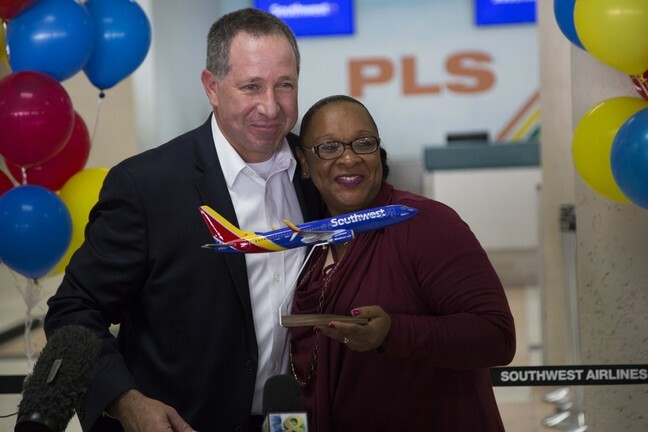 DALLAS, TX, 2017-Nov-06 — /Travel PR News/ — Furthering its reach, Southwest Airlines Co. (NYSE: LUV) today began operating new international service daily from Ft. Lauderdale-Hollywood International Airport (FLL) to Providenciales International Airport (PLS) in the Turks and Caicos Islands, the carrier’s 11th country served. In addition, Southwest® initiated new service between its South Florida gateway at FLL and both San Jose, Costa Rica (SJO), and Punta Cana, Dominican Republic (PUJ), giving Customers nonstop access from Fort Lauderdale to 10 destinations in Latin America and the Caribbean. * There are no change fees, though fare differences might apply. First and second checked pieces of luggage, size and weight limits apply. In a partnership with Broward County, Southwest continues work to transform and expand Terminal 1 at FLL into a vastly improved facility with additional gates, security screening, concessions, and border processing capacity. Southwest launched additional international service from FLL in June 2017. Southwest recently extended its bookable flight schedule through early August 2018 bringing new, international service on Saturdays next summer betweenHouston and Grand Cayman. In addition, service between Cancun and both Pittsburgh and Raleigh-Durham will operate nonstop on Saturdays beginning June 9, 2018, subject to governmental approvals. The summer 2018 flight schedule is Southwest’s largest-ever for Cancun with nonstop service from 16 gateway airports in the U.S. peaking at 27 departures to Cancun on Saturdays. Southwest also increased summer season 2018 service to Puerto Rico with daily flights between San Juan and Chicago Midway, which had operated only on weekends in Summer 2017, and augmented daily seasonal service between San Juan and Houston Hobby, with a second flight on Saturdays and Sundays beginning June 9, 2018. In its 47th year of service, Dallas-based Southwest Airlines Co. (NYSE: LUV) continues to differentiate itself from other air carriers with exemplary Customer Service delivered by more than 55,000 Employees to a Customer base topping 115 million passengers annually, in recent years. Southwest became the nation’s largest domestic air carrier in 2003 and maintains that ranking based on the U.S. Department of Transportation’s most recent reporting of domestic originating passengers boarded. During peak travel seasons, Southwest operates more than 4,000 weekday departures among a network of 100 destinations in the United States and ten additional countries. Southwest has announced its intention to sell tickets in 2018 for service to Hawaii, subject to requisite governmental approvals. From its first flights on June 18, 1971, Southwest Airlines launched an era of unprecedented affordability in air travel described by the U.S. Department of Transportation as “The Southwest Effect,” a lowering of fares and increase in passenger traffic wherever the carrier serves. With 44 consecutive years of profitability, Southwest is one of the most honored airlines in the world, known for a triple bottom line approach that contributes to the carrier’s performance and productivity, the importance of its People and the communities they serve, and an overall commitment to efficiency and the planet. The 2016 Southwest Airlines One Report™ can be found at SouthwestOneReport.com. Book Southwest Airlines’ low fares online at Southwest.com or by phone at 800-I-FLY-SWA. Visit the Southwest Newsroom at swamedia.com for multi-media assets and other Company news. This entry was posted in Airlines, Airports, Flights, Travel, Travel Management, Travel Services, Travelers and tagged Costa Rica, Dominican Republic, Southwest Airlines, Steve Goldberg, Turks and Caicos Islands. Bookmark the permalink.